I found this writing challenge while stumbling about on Twitter. 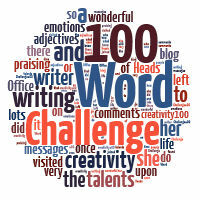 I do like a good writing challenge, especially one I can knock out before breakfast, so the 100 words for grown-ups challenge, run weekly by The Head’s Office, grabbed me straight away. This week the challenge was to take one (or all three) of a list of words that have recently been deleted from the COED and used them in a 100-word piece. I love the COED – it’s one of my must-have tools when I’m working – but I’m also enough of a word-geek that I enjoy simply flipping through it reading definitions at random. Therefore, for this challenge I decided to go all definitional, but then got a bit sidetracked on the last one – well, you’ll see what I mean. Foozle – the kind of mess that happens when a small black kitten, intent only on trying to help, decides to tidy a basket of wool. Brabble – what happens when Twitter gets a bit overheated about someone’s unfavourable review of Dr Who. Growlery – a private growly place, just for me? Goodness, I wish I had one of those. I’d never leave it. There’d be a big sign on the door saying “GO AWAY, I’M GROWLING”, and some books, and a kettle, and probably some chocolate, and more books, and my computer, and my cat, and more books, and … oh. Sorry. I have foozled it too. I officially can’t do clever haiku! Reminds me of Call My Bluff, although I wasn’t thinking of it at the time. Clearly I’d have been rubbish at that, though – too easily distracted! What an original way to use the prompt. Reminded me of “The daft dictionary” by Gyles Brandreth that I had as a child. Super. I like the idea of doing this as a series of definitions. I particularly like the one for foozle. That definition may or may not have been based on the behaviour of a certain cat who may or may not live with me. Let’s just say I don’t leave balls of wool on the floor any more.